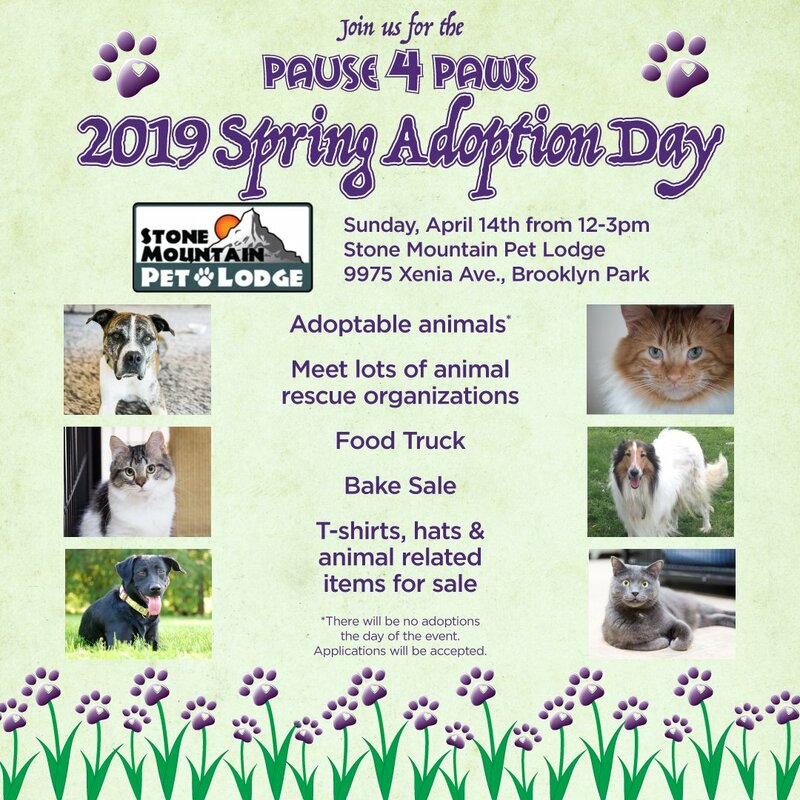 Pause 4 Paws helps both dogs and cats in need. 35,000 dogs and cats rescued and nearly 25,000 spay and neutered. Pause 4 Paws was established in 2011 with a mission of working to ensure that dogs and cats are treated with dignity and respect. Pause 4 Paws supports 11 animal rescues and sanctuaries in Minnesota and supports the rescue community in Puerto Vallarta, Mexico. Most animal rescues are small, volunteer-based community organizations that do not have staff available to spend time fundraising. P4P works on behalf of these organizations. Our Beneficiary Organizations have saved over 35,000 dogs and cats and spayed or neutered nearly 25,000 animals since 2011. Saturday, May 18th, 2019 -- BUY TICKETS! Tour of the Minnesota River Valley (see map below). We hope you will join us for our second annual motorcycle ride benefitting Pause 4 Paws. Dave Ryan and his wife, Susan, adopted Roger from one of our Beneficiary Organizations. They bottle fed him until he was big enough to eat on his own, and the rest is history! We will have photo ops, a punch board, and a chance to meet adoptable animals! The ride will start at American Legion Post 47 in Hastings, MN (50 Sibley Street) and have two additional stops. the No Name Saloon in Prescott, WI (114 Broad Street). Click on the map below to see the full route. See you there! Please join us for our annual fall fundraising event. This event is the key to our work at Pause 4 Paws -- the donations that are provided enable us to support our Beneficiary Organizations around the state, as well as the services we provide throughout the year, including spay and neutering, adoption support, foster care, and emergency medical treatments. As always we will have great food and drink, our amazing silent and live auctions, as well as other opportunities to win prizes and support the animals! Anakin is an 8 year old mixed breed who needs a foster or forever home. He loves people, is loyal and obedient, and despite his 80 pounds of muscle, thinks he's a lap dog! Anakin loves toys and is currently attending a training school, learning how to be his best self. Anakin needs to be the only pet in the house but he will give you all the snuggles you'll ever need. Please help him find his person! For more information, contact Jill Goldstein at (612) 810-2893 or email Jennifer Ryan at jennifer@pause4pawsmn.org. No Dog Left Behind is a 100% foster based 501(c)(3) non-profit whose mission is to find dogs their forever family; to speak for the abused, neglected, and abandoned; to educate adopters, reduce the number of homeless, and provide proper vet care; and to save those that need saving. NDLB is volunteer-based and relies heavily on donations to support the organization. The amazing support from the community, fosters, veterinarians, and friends gives NDLB the ability to save dogs who otherwise wouldn't make it. They place all dogs in foster homes so they can work with each dog individually to train them and give the proper care they need. This helps NDLB understand their personalities to match them with the perfect forever home! Your financial support enables Pause 4 Paws to help save the lives of animals and to improve their quality of life through rescue, adoption and sanctuary. The funding that P4P distributes to its rescue organizations has helped save more than 35,000 animals and facilitated spay/neutering for nearly 25,000 dogs and cats, but our work is not done. Please consider joining our efforts by making a contribution. You can give your support in any amount by making an on-line donation, or you can become a formal Pause 4 Paws Sponsor. We are currently in the process of updating our on-line donation system. In the meantime, please click here to make an on-line donation. THANK YOU! Twin Cities Brewery Tours1 week agoLook at these adorable ADOPTABLE faces that you can meet tomorrow at our 2019 adoption day from 12-3 at stone mountain pet lodge! We can't wait to see you! Our Sponsors lend their support to Pause 4 Paws through financial donations, media sponsorship, and in-kind services. These sponsorships provide critical support for the daily work and operation of our organization as well as our fundraising efforts -- 100% of the funding we distribute through P4P goes directly to the support and care of the animals. We are extremely grateful for the dedication and support we receive from our Sponsors.